I wrote a post here about a weekend I spent with Grandad. 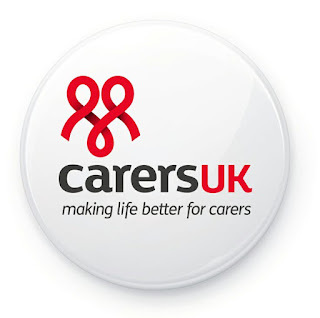 I mentioned that my Mum has taken on the role of his main carer, what I haven't mentioned is that we also have help from an employed carer as well. Some people and families struggle with the idea of having someone else come in to fulfil the caring role. Our family struggled, I struggled with it. We struggled with feelings of guilt, that we should be the ones providing the care, we also struggled with trusting someone we did not know to care for a loved one. Although I supported my Mum to seek a needs assessment for Grandad and pursue a personal budget for him, I still find it difficult putting his health and wellbeing in the hands of someone else. Perhaps it is similar when parents leave their children in the care of others, I haven't had children to know what that feels like. Luckily, we found a care agency who provided us with a lovely carer who we, as a family, get on well with. Most importantly so does Grandad. Grandad's carer comes in everyday from 9.30 until 2.30 to allow my Mum some time to continue some of the activities and routines that structured her life prior to Nan becoming ill. My mum, and other family carers, need this precious time for themselves, to remain their own person outside of their role as a carer, to retain their identity and resilience. Due to the carers personal situation, she cannot continue in her role with Grandad so yesterday we interviewed for her replacement. This time we have decided to directly employ someone instead of going through an agency. This is not a straightforward process for individuals and families with no knowledge of employment legislation (luckily, my Dad has some knowledge in this area). However, there are organisations who can offer support to family carers; Carers UK or more locally to me, Suffolk Family Carers. So, what do I want from someone caring for my Grandad? What sort of questions do I want to ask or be asked of those who apply for the position? What if we make the wrong choice and things go wrong? What worries me most is that Grandad wouldn't be able to tell us if something wasn't right. I answered my questions by thinking about the values I feel are important for individuals who need support with daily tasks; respect, choice, independence, person centred and patience. These were the things I looked for, alongside how the individuals interacted with Grandad during the interview and their experiences.